After Trump: Is the Damage Media Wrought Irreversible? Even if they unearth videotape of Trump in bed with Putin – or with Putin's dog – and remove him from power, the vicious, nasty, little racist cretin Jeff Sessions will still be in office, doing untold damage. He is now leading an aggressive crusade to “untie the hands” of militarized, brutalizing police forces across the country — especially the ones who have been slapped with federal restrictions for their confirmed, egregious, endemic, systematic racism. 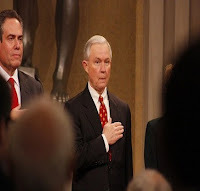 Sessions wants to set them loose on the uppity darkies who stir up the ancestral ghosts in his slavers’ blood and trouble his dreams with quaking fears and forbidden desires. Trump’s removal — as desirable as it is — will do nothing to rectify the damage he’s already done or stop the further wreckage that his regime will do for the next four years, whether he’s in the White House or not. It’s inconceivable that the genuinely weird and hateful Mike Pence would remove soulmates like Sessions from office should he take over from Trump. Pence could conceivably be even worse, as a relieved nation — and media/political establishment — give him a free ride (“The grown-ups are back in charge!”) while he accelerates the destructive policies of Trump and the radical extremists in Congress (and in state houses all over the country). But the ascension of sinister little goobers like Session was always going to be the end result of the boundless free publicity the media gave Trump during the campaign, with even our lib-lauded "rock star" dissidents at SNL yukking it up with the Donald, normalizing him. As it happens, my first intimation of this involved Sessions. I was in an airport on a visit to the US, with the ubiquitous TV screens hanging down everywhere, blaring the news, and the commercials. (God forbid anyone should be able to sit in a public place and think their own thoughts without constant bombardment by commercialized inanity.) During my long lay-over, I saw CNN showing an entire Trump rally -- the whole thing, unedited, uninterrupted, all the poison lies pouring out of his mouth and the nutball surrogates who preceded him on the stage. Then Trump introduced Sessions, who became the first US senator to endorse him. I kept thinking: What the hell is going on? I’d been following US politics since the LBJ-Goldwater race, and I’d never seen ANY political rally by ANY candidate given that kind of wall-to-wall coverage. I could understand cutting to the rally for a few minutes of the Sessions endorsement as breaking news, but that's not what was happening. I was in the waiting area for more than two hours, and the entire time was given over to Trump and his sick crew. Why? Even incumbent presidents running for re-election never got airplay like that. None of other GOP candidates were getting anything near that kind of coverage. Hillary Clinton got only a bit more than they did. It goes without saying that Sanders and his mass rallies of thousands of supporters where ignored almost entirely. But the cameras kept running for Trump. We now know the president of CBS, Leslie Moonves, bragged about how good Trump was for the corporation's bottom line, even if he was "bad for the country." We also now know that the Clinton campaign itself had a deliberate, extensive strategy to push Trump to its many media contacts as a "serious" candidate, in order to undercut what they believed to be more credible threats to her chances. The media and political establishments — now so horrified by Trump that they’re begging the blood-soaked spies and covert operators of the “intelligence community” to save them from the big bad monster — were the chief engineers of his political rise. They pushed him and promoted him, knowing full what he was — a dangerous ignorant demagogue with an openly authoritarian bent. They knew —CNN knew, CBS knew, Clinton knew — the risk such a figure posed to the nation should he get elected. They knew he was “bad for the country.” But their profits — and their personal ambitions — were more important to them. It was more important to Clinton to help elevate an existential threat to American society because she thought it would help her. It was more important to the networks to boost Trump because of the big bounce to their bottom line. (And if he won, his rapacious, pro-corporate economic policies would help them as well. With two eager pro-corporate candidates in play, the election was always going to be a win-win for them). They knew the risk — but they took it anyway. And why not? Neither the multimillionaire Clinton nor the multibillion-dollar corporations would suffer the consequences of a Trump presidency. Now here we are, and here we will be for the next four years – or even eight years, given the current state of the Democratic Party, and inability of that gaggle of corporate sellouts, war-profiteering pimps and neo-McCarthyite nutcases to offer any genuine, hopeful alternative to Republican extremism, beyond more of the same callous, soulless neoliberalism that has decimated the party in the first place. The wall-to-wall coverage — and Clinton’s secret promotion — of Trump are not the sole factors in his disastrous victory, of course; but without them, we almost certainly not be in the ever-deepening hell where we are today. Where's Pompeo: CIA AWOL on Syria Attack? Where Was CIA’s Pompeo on Syria? 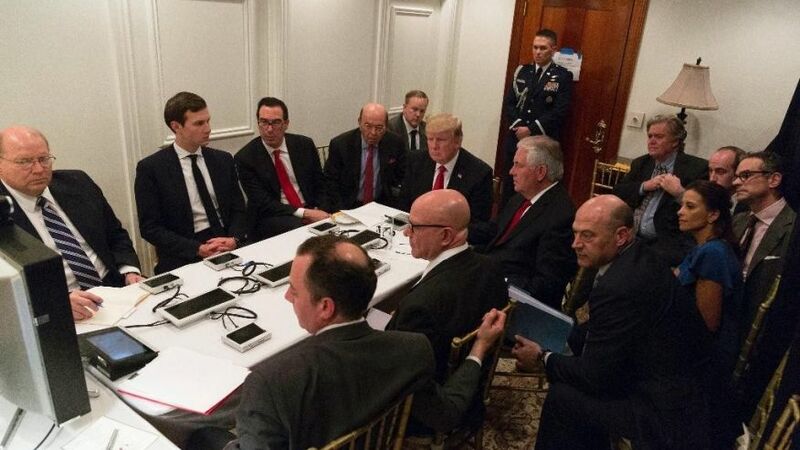 There is a dark mystery behind the White House-released photo showing President Trump and more than a dozen advisers meeting at his estate in Mar-a-Lago after his decision to strike Syria with Tomahawk missiles: Where is CIA Director Mike Pompeo and other top intelligence officials? on April 6, 2017, regarding his decision to launch missile strikes against Syria. Before the photo was released on Friday, a source told me that Pompeo had personally briefed Trump on April 6 about the CIA’s belief that Syrian President Bashar al-Assad was likely not responsible for the lethal poison-gas incident in northern Syria two days earlier — and thus Pompeo was excluded from the larger meeting as Trump reached a contrary decision. At the time, I found the information dubious since Trump, Secretary of State Rex Tillerson and other senior U.S. officials were declaring quite confidently that Assad was at fault. Given that apparent confidence, I assumed that Pompeo and the CIA must have signed off on the conclusion of Assad’s guilt even though I knew that some U.S. intelligence analysts had contrary opinions, that they viewed the incident as either an accidental release of chemicals or an intentional ploy by Al Qaeda rebels to sucker the U.S. into attacking Syria. As strange as the Trump administration has been in its early months, it was hard for me to believe that Trump would have listened to the CIA’s views and then shooed the director away from the larger meeting before launching a military strike against a country not threatening America. As much as Trump stood to benefit politically by acting aggressively in attacking Syria — and thus winning praise even from his harshest critics — the idea that he would ignore the views of the U.S. intelligence community on an issue of war or peace was something that I found hard to believe. So, I put aside what I had heard from the source about the discordant Pompeo-Trump meeting as the sort of tidbit that may come from someone who lacks first-hand knowledge and doesn’t get all the details right. After all, in almost every similar situation that I had covered over decades, the CIA Director or the Director of National Intelligence has played a prominent role in decisions that depend heavily on the intelligence community’s assessments and actions. For instance, in the famous photo of President Obama and his team waiting out the results of the 2011 raid to kill Al Qaeda leader Osama bin Laden, CIA Director Leon Panetta is the one on the conference screen that everyone is looking at. Even when the U.S. government is presenting false information, such as Secretary of State Colin Powell’s 2003 speech laying out the bogus evidence of Iraq hiding WMDs, CIA Director George Tenet was seated behind Powell to lend credibility to the falsehoods. But in the photo of Trump and his advisers, no one from the intelligence community is in the frame. You see Trump, Secretary of State Tillerson, National Security Adviser H.R. McMaster, White House chief of staff Reince Priebus, strategic adviser Steve Bannon, son-in-law Jared Kushner and a variety of other officials, including some economic advisers who were at Mar-a-Lago in Florida for the meeting with Chinese President Xi Jinping. That made me wonder whether perhaps my original source did know something. The claim was that CIA Director Pompeo had briefed Trump personally on the analysts’ assessment that Assad’s forces were not responsible, but – then with Pompeo sidelined – Trump conveyed his own version of the intelligence to his senior staff. In other words, the other officials didn’t get the direct word from Pompeo but rather received a second-hand account from the President, the source said. Did Trump choose to rely on the smug certainty from the TV shows and the mainstream news media that Assad was guilty, rather than the contrary view of U.S. intelligence analysts? After the attack, Secretary of State Tillerson, who is not an institutional intelligence official and has little experience with the subtleties of intelligence, was the one to claim that the U.S. intelligence community assessed with a “high degree of confidence” that the Syrian government had dropped a poison gas bomb on civilians in Idlib province. While Tillerson’s comment meshed with Official Washington’s hastily formed groupthink of Assad’s guilt, it is hard to believe that CIA analysts would have settled on such a firm conclusion so quickly, especially given the remote location of the incident and the fact that the initial information was coming from pro-rebel (or Al Qaeda) sources. Thus, a serious question arises whether President Trump did receive that “high degree of confidence” assessment from the intelligence community or whether he shunted Pompeo aside to eliminate an obstacle to his desire to launch the April 6 rocket attack. If so, such a dangerous deception more than anything else we’ve seen in the first two-plus months of the Trump administration would be grounds for impeachment – ignoring the opinion of the U.S. intelligence community so the President could carry out a politically popular (albeit illegal) missile strike that killed Syrians. We will have local craft beer, food trucks and live music. Try the best of West Coast brews for an awesome cause! EARLYBIRD/// 20 - admission gets you three beer tickets! 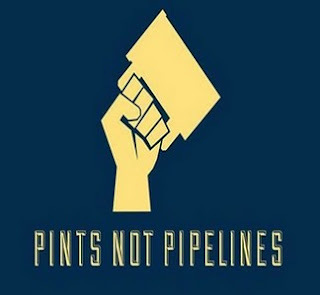 You get to vote on the best craft beer, all admission goes directly to Pull-Together- a fundraiser for First Nations lawsuits against the Kinder Morgan Transmountain tar sands pipeline. Sponsors include Dogwood Brewing Company, Faculty Brewing Strange Fellows Brewing Arturo's and Chickpea food trucks! More to be announced shortly, if you are part of a business and would like to donate, please get in touch! Performance Works is an amazing venue on Granville Island! If it is sunny out we will have the roll-up garage doors open and access to a great lawn! Regardless of weather we will have great dance jams Nikki Hebert from 90s night at the Astoria will be playing dark 80s pop and 90s jams!! and a bunch of great people celebrating this coast and standing with First Nations protecting it from tar sands expansion. This event is organized on the unceded territory of the Coast Salish: the Musqueam Tsleil-Waututh and Squamish Nations. Pull Together is donating to the Coldwater and Tsleil-Waututh First Nations and is organized by Force of Nature Alliance, RAVEN trust, Sierra Club BC and many passionate and dedicated volunteers. *beer responsibly* arrange a ride or take transit. Ukraine’s quest to get access to sophisticated Western weapons and defence technologies to fight Russian-backed rebels in the eastern part of the country got a step closer with a defence co-operation agreement signed in Ottawa earlier this week. “Today’s signing of the Defence Cooperation Arrangement shows Canada’s steadfast commitment to Ukraine and the Ukrainian people,” Sajjan said in a statement. The agreement is “a great sign of support for Ukraine,” said Ukraine’s ambassador to Canada Andriy Shevchenko in an interview with Radio Canada International. But it’s also a two-way street that would allow Canada to benefit from the cooperation with Ukraine, he said. “One of the avenues of cooperation is to make sure that Ukraine shares the lessons that we learned fighting the war against Russia in the east of the country,” Shevchenko said. The deal was also welcomed by the Ukrainian Canadian Congress (UCC), which had lobbied hard the previous Conservative and the current Liberal government of Prime Minister Trudeau to provide Ukraine with lethal military aid, in addition to the non-lethal assistance Ottawa began providing following Russia’s annexation [sic] of Crimea. “Today’s signature is an important step forward in strengthening Canada and Ukraine’s bilateral security and defence relationship,” Paul Grod, national president of the UCC, said in a statement. After the collapse of the Soviet Union, Ukraine inherited a vast military industrial complex capable of producing everything from tanks and armoured vehicles to aircraft and ballistic missiles. However, without sustained investment in research and development, Ukraine’s defence industry has fallen behind of not only Western but also the Russian military industrial complex with which it was closely intertwined prior to the 2014 crisis in Eastern Ukraine. The deal with Canada could give the once neglected Ukrainian defence industry access to state-of-the-art Canadian and Western technology, particularly in modern communications, electronics, night vision equipment, precision guided munitions, as well as target identification and acquisition systems. “I think this agreement brings us one step closer to that objective,” Shevchenko said. The arrangement recognizes the fact that Canada and Ukraine have a very mature partnership, he said. “I think there is very pragmatic common interest that we have that it comes to defence,” Shevchenko said. Coming on the heels of Trudeau’s decision to extend Operation UNIFIER, Canada’s military training mission in Ukraine until the end of March 2019, the deal signals further toughening of Ottawa’s line against Russia. “Canada remains fully committed to providing assistance to Ukraine, helping to preserve and protect its sovereignty through Operation UNIFIER, and to supporting the implementation of key reforms,” Sajjan said. However, as expected, the deal was met with stern criticism by Russian authorities. “Rather than encourage Kiev regime’s military ambitions, real efforts should be taken by Ottawa to force the Ukrainian authorities to fully implement the Minsk accords, including direct political dialogue with Donetsk/Lugansk republics, as well as to push forward constitutional reform,” said Kirill Kalinin, the spokesperson of the Russian Embassy in Canada, referring to the pro-Russian self-declared republics in the rebel-controlled parts of Donetsk and Luhansk regions of Eastern Ukraine. “Killings of civilians in Donbas by Ukrainian forces should have stopped a long time ago,” he added. Both the pro-Western government in Kyiv and the pro-Russian rebels in the Donbas region accuse each other of undermining key elements of the 2015 Minsk Agreements to resolve the conflict by peaceful means. Both sides also accuse of each other of indiscriminate shelling of civilian areas. According to the UN human rights office, the total death toll from mid-April 2014 to early December 2016 stands at 9,758 with another 22,779 people injured. This includes more than 2,000 civilians killed and over 6,000 injured. Those numbers have only increased due to the recent flare-up of renewed fighting between government forces and rebels. It’s called “Operation Unifier”. Canada’s two year mission to train Ukrainian military and police was due to expire at the end of this month. Ukrainian officials had been concerned at the delay in the decision by Canada to announce an end or extension of that mission. At a news conference today, it was announced the mission will be extended. Defence Minister Harjit Sajjan told reporters, the announcement sends the message that “we stand with Ukraine”. It doesn’t take a military analyst to grasp that the American attack on a remote Syrian airfield contradicts every possible military rationale. If America really believed that Assad possessed a WMD stockpile and kept it in al-Shayrat airbase, launching a missile attack that could lead to a release of lethal agents into the air would be the last thing it would do. If America was determined to ‘neutralise’ Assad’s alleged ‘WMD ability’ it would deploy special forces or diplomacy. No one defuses WMD with explosives, bombs or cruise missiles. It is simply unheard of. America targeted al-Shayrat because it knew with certainty that there were no WMD in that location. It was a firework show. It had no military objective. The first concern that comes to mind is why do you need a saxophonist to deliver the truth every military expert understands very well? Can’t the New York Times or the Guardian reach the same obvious conclusion? It’s obvious enough that if Assad didn’t use WMD when he was losing the war, it would make no sense for him to use it now when a victory is within reach. 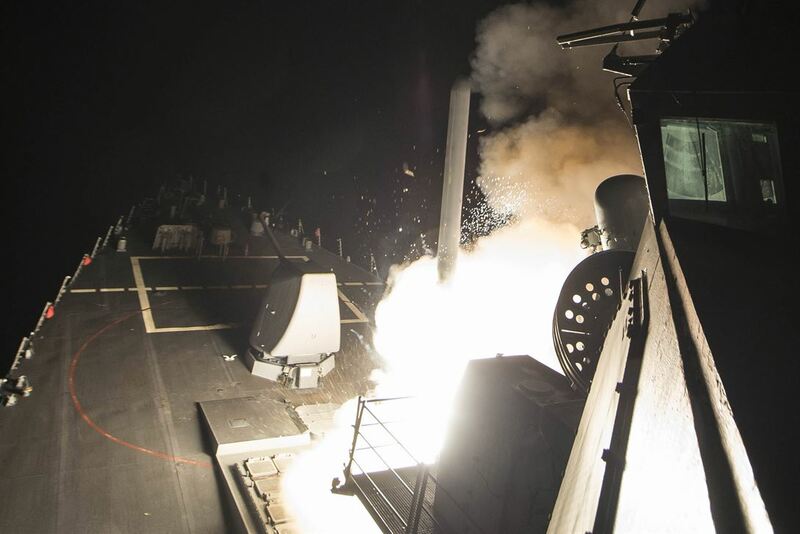 So why did the White House launch a cruise missile blitz on a non-existent target? We know who are the first to benefit from the current escalation. The Jewish State that gambled on regime change in Syria, consistent with the sinister Yinon Plan, accepts by now that Assad is there to stay. But here is the peculiar development: while the BBC, the Guardian, the New York Times and the White House refer to Assad and his ‘chemical warfare’ with certainty, the Israeli press is actually very careful. The Israeli Ynet only refers to Assad’s ‘alleged’ gas attack. The Israelis do understand that the story, as it stands, doesn’t make any sense. But there may be another narrative that could introduce some method to the madness. The CIA and the FBI do not seem to drift away from Trump and his ties with Russia. This weekend we learned that former Trump adviser Carter Page 'gave documents to a Russian spy.' Carter Page, who was a foreign policy aide to the President before the election, met occasionally with Victor Podobnyy while the intelligence operative was working in the US. Mr Podobnyy was one of three men indicted by the FBI in 2015 on suspicion of working for Russia's SVR foreign intelligence service. We also learned this weekend that Trump’s son-in-law Kushner failed to alert the FBI to several meetings with Russian officials despite a legal obligation to do so. His lawyer described the omission as an "administrative error." The Guardian reports that the CIA actually reported to senior lawmakers in classified briefings last summer that it had information indicating that Russia was working to help elect Donald J. Trump as president, a finding that did not emerge publicly until after Trump’s victory months later. President Trump has rejected any suggestion of a Russian connection as “ridiculous” and “fake news.” Trump could probably win the liberal press but the CIA and FBI have proved harder nuts to crack. Trump was left with no other option, he needed a firework show to convey a clear image of a conflict between himself and Putin. He had to invent a war with Russia. The Mirror bought into this façade: ‘Donald Trump warned he is one step away from military clashes with Russia,' its headline read. It seems as if launching a missile attack on a deserted Syrian airfield while alerting the Russians in advance would convey the necessary patriotic image to the American people. 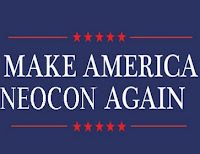 It would convince the Ziocons that the White House is ready to launch WWIII on their behalf. The attack was there to convince the American people that Trump is not a Russian puppet. Shockingly enough, the liberal press was very quick to straighten line with Trump. The uniquely banal Jonathan Freedland wrote in the Guardian today “sometimes the right thing can be done by the wrong person. Donald Trump’s bombing of a Syrian airfield seems to belong in that category.” Seemingly the Guardian never misses an opportunity to rally for a Ziocon war. 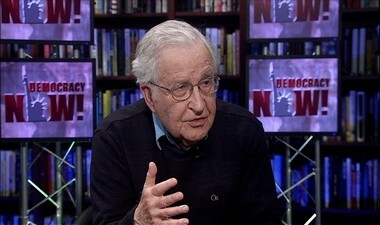 Is Noam Chomsky Manufacturing Consent for Regime Change in Syria? One might well expect the corporate/state media to twice be complicit for the “gas attack perpetrated by the Syrian regime” scenario. One would hope, however, media independent of the state and corporate sponsors would apply a higher journalistic standard. Yet Democracy Now! has been pushing the imperialist agenda for regime change in Syria. DN begins with the leading statement of “worldwide outrage mounts over an alleged chemical weapons attack in Idlib province, which was reportedly carried out by the Assad government…” No evidence is presented to support the accusation, and the accusers also are unnamed. What kind of journalism is this? It would be completely nonsensical and insane for Syria to use chemical weapons while the war is turning in its favor. And, of course, there is evidence that refutes the allegation. For the record, when a Zionist and war criminal Barack Obama was bent on attacking Syria in 2013 following false accusations that the Assad government used sarin gas in Ghouta, Syria – to preempt the threatened invasion Assad agreed (UN Resolution 2118) to give up Syria’s stockpile of chemical weapons (a deterrence against Israel’s nuclear weapons). Now the Syrian government stands accused of using a chemical that was disposed of under international supervision. Is the Syrian government that stupid to risk another threat of invasion by using a non-conventional attack? And why is this new gas attack in Idlib taking place just after Rex Tillerson declared that it is the Syrian people who should decide the fate of their current president? How about a dose of skepticism? After all, Chomsky speculated recently of a Donald Trump-orchestrated false flag. Chomsky’s opening omissions speak loudly. He goes straight at the Syrian government; he does not mention involvement by the US, Israel, and other western states. He does not mention the western, Saudi, and Qatari-backed terrorist mercenaries that seek to topple a foreign government through violence. Indeed Chomsky, the linguist, has dipped into the imperialist lexicon. He criticizes the Assad “regime.” I am unaware of Chomsky ever referring to a Trump, Obama or other US “regime” or of an Israeli “regime.” To be sure, Chomsky has been a critic of US terrorism and imperialism and of Zionist crimes against Palestinians, but I am unaware of Chomsky referring to US, Israeli, or other western regimes as a “moral disgrace.” It might be implicit but not explicit. The US is uninvited and Syrian president Assad calls US forces in Syria “invaders.” Chomsky is well versed as to what happens when uninvited US forces show up in foreign lands – among them Korea, Viet Nam, Panama, Grenada, Somalia, Haiti, Afghanistan, Iraq, Libya, Yemen, etc: genocide, millions killed, millions displaced, economic infrastructure destroyed, and vassalage. Is the West’s refusal of a negotiated settlement not a “moral disgrace”? Suicide? When US invaders are in Syria, when western governments and operatives are arrayed against the Syrian government, when Saudi and Qatari governments are supporting terrorists, and when Syrian people are being killed and made into refugees, then why describe this as a “suicide”? Does Chomsky want to imply that the Syrian people bear responsibility for the horror and decimation imposed upon them from outside? It sounds absurd. As a first imperative, all uninvited outsiders should vacate Syria immediately. As a second imperative, all parties responsible for aggression against Syria and its peoples must be charged and prosecuted. Third, any crimes committed by the Assad government in allegedly putting down peaceful protests must be investigated and where such charges are valid, then prosecution must be carried out. Noam Chomsky has garnered enormous respect for his opposition to US crimes, support for social justice, and anarchist leanings. Yet, Chomsky also stakes out positions that appear flawed (his statement that the truth doesn’t matter as to 9-11), even morally questionable (his opposition to the Palestinian-led Boycott, Divestment, and Sanctions movement). It is imperative is that people become informed. We should all listen to the words of intellectuals and persons who have demonstrated great integrity, but we must also pay heed to our internal dissonance to seemingly incongruous information; we must question and apply rigorous challenge to that information; and based on our assessment of the factual accuracy, logic, and morality of the information we must reach our own conclusions. Avoid the allure of unquestioningly accepting the words of authority! Regardless of personage, open-minded skepticism is the key to developing our own ability to cut through disinformation and thwart the insidious acts propaganda is intended to disguise. 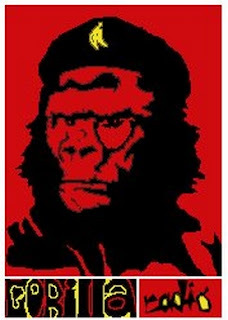 Critical and moral thinking is crucial to the revolution for a free and socially just world. Serious questions have arisen about how Democracy Now!, begun and developed with the resources of Pacifica Radio and grants from the Carnegie Corporation, the Ford Foundation, the J.M. Kaplan Fund and others, suddenly became independent and the effective property of Amy Goodman without recompense to Pacifica. This transfer apparently included valuable assets such as trademarks, ownership of years of archived programs, affiliate station access, and more. In a contract that remains secret, Amy Goodman is also receiving $1 million per year for a five-year period that began in 2002, according to Pacifica Treasurer Jabari Zakiya, to continue doing what has become Pacifica’s flagship morning news program. This is more than double Goodman’s officially stated stipend of $440,000 per year from Pacifica Radio. Kim Petersen is a former co-editor of Dissident Voice. He can be reached at: kimohp@gmail.com. Twitter: @kimpetersen. Read other articles by Kim. On April 7, two U.S. Navy battleships USS Porter (DDG-78) and USS Ross launched 59 Tomahawk cruise missiles at al-Shayrat military airfield in Syria’s Homs province from the Eastern Mediterranean. The U.S. strikes particularly targeted the main landing strip, aircraft, radio locators, air defense system and fuel stations. The strike was approved by U.S. President Donald Trump, who said that the Syrian Air Force had used affiliated al-Shayrat air base to prepare chemical attack on the city of Khan Shaykhun in Idlib. “It is in this vital national security interest of the United States to prevent and deter the spread and use of deadly chemical weapons”, Trump said. Previously, on April 4, several European states accused Syrian Air Force of using warfare poisonous agents while striking Khan Shaykhun. Syrian government, in its turn, refuted these accusations, stating that the target of the strike was a militants’ position where they had organized a chemical depot. The strike led to the spread of poisonous agents and dozens of casualties among civilians. Though the situation in Khan Shaykhun is still unclear, the U.S., France, and Great Britain have already prepared and sent a draft resolution to the U.N. In their draft, they put the responsibility for the death of civilians on the Syrian government. The tragedy in Khan Shaykhun allowed Washington to duplicate the scenario developed in 2013 for a chemical attack in Eastern Ghouta. Then the U.S. President Barack Obama also considered a possible military strike on Syria, allegedly in order to prevent the use of chemical weapons in future. However, in 2013 several reasons prevented the U.S. from initiating large-scale aggression against Syria. Just after being published, the materials about the use of chemical weapons began to acquire additional details, which indirectly indicated the involvement of the U.S. and their allied groups in the false flag chemical attack. It turned out that this provocative act had been preliminary and carefully planned by the military experts. This is evidenced by hacked correspondence of U.S. Army Colonel Anthony Jamie MacDonald, who was General Staff Director, Operations and Plans Office of the Deputy Chief of Staff for Army Intelligence in 2013. On August 22, the day after the chemical attack, MacDonald received a message from his colleague Eugene Furst with congratulations on the “successful operation” and a link reference to an article on Eastern Ghouta in The Washington Post. The media leak of MacDonald’s correspondence has become another piece of evidence proving that the Syrian government was not involved in the use of chemical weapons in Eastern Ghouta. Earlier, Damascus had already been blamed for using poisonous substances, but all these attempts to make the accusations stick have failed. In the same 2013, the UN investigation proved that the militants were responsible for the use of sarin . Carla Del Ponte, the head of the UN commission, stated so publicly. Subsequently, it turned out that the availability of chemical ammunition among opposition groups was recorded on video. Moreover, some American analysts also pointed out the doubtful nature of the information claiming the involvement of Damascus in chemical attacks. In an open message to Barack Obama, former CIA officers blamed CIA director George Bennett for providing unreliable information to the U.S. authorities regarding the incident in Eastern Ghouta and for using it to prepare members of the U.S. Congress, the media and the public for an attack on Syria. Finally, under the pressure of the world community, Washington had to join the Russian initiative to eliminate chemical warfare agenda in Syria. This operation was held under the supervision of the Organization for the Prohibition of Chemical Weapons (OPCW) and was successfully completed in January 2015. As in the case of Eastern Ghouta, Western media have given biased reporting of the incident in Khan Shaykhun, accusing the Syrian government of causing the death of civilians without seeing even preliminary results of an investigation. At the same time, as if not to burden its readers with unnecessary doubts about the official version of events, the Daily Mail removed from its website a 2013 article about the U.S. plans to stage false flag chemical attacks in Syria. Against this background, Washington’s decision to fall back upon its original scenario for Eastern Ghouta raises many questions. First, it contradicts the promises made during Donald Trump’s election campaign, when he promised to stop military actions directed against Bashar Assad and to focus instead on fighting terrorism. Second, accusing Damascus of using chemical weapons contradicts the OPCW statement confirming the successful conclusion of its removal program, in which the U.S. also took part. Third, it is unclear what the White House wants to achieve by escalating conflict in Syria. The chemical attack in Idlib appears to be another provocation by the U.S., an attempt to justify a military intervention in Syria. It seems also that the new American administration is paying for its approval ratings with the blood of innocent Syrians as it tries to strengthen its internal political position. As U.S. Politicians and Pundits Cheer Syria Bombing, Will ISIS and Al Qaeda Benefit? Independent journalist Rania Khalek discusses the near-uniform media and political support for President Trump's decision to bomb a Syrian military airfield, the need for an independent investigation into the Idlid chemical attack, and why she thinks the U.S. strike may benefit ISIS and Al Qaeda. Rania Khalek is an independent journalist and co-host of the weekly podcast Unauthorized Disclosure. Her work has appeared at The Nation, FAIR, Vice, The Intercept, Alternet, Salon, The Electronic Intifada, Al Jazeera and more. After the Bombing: How Can Don Make It Up with Vlad? President Donald Trump’s missile attack on the Shayrat Airfield in Western Syria was a poorly planned display of imperial muscle-flexing that had the exact opposite effect of what was intended. While the attack undoubtedly lifted the morale of the jihadists who have been rampaging across the country for the last six years, it had no military or strategic value at all. The damage to the airfield was very slight and there is no reason to believe it will impact the Syrian Army’s progress on the ground. The attack did however kill four Syrian servicemen which means the US troops in Syria can no longer be considered part of an international coalition fighting terrorism. The US is now a hostile force that represents an existential threat to the sovereign government. Is that the change that Trump wanted? “In addition to suspending the pact to coordinate air operations over Syria, an accord that was meant to prevent accidental encounters between the two militaries, Russia also said it would bolster Syria’s air defense systems and reportedly planned to send a frigate into the Mediterranean Sea to visit the logistics base at the Syrian port of Tartus…. The missile attack has ended all talk of “normalizing” relations with Russia. For whatever the reason, Trump has decided that identifying himself and the United States as an enemy of Moscow and Damascus is the way he wants to conduct business. That, of course, is the President’s prerogative, but it would be foolish not to think there will be consequences. 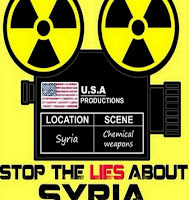 “All the accusations against Damascus that it violated the Chemical Weapons Convention of 2013 given by the USA as reasons for the strike are groundless. The Russian Defence Ministry has repeatedly explained that the Syrian troops had not used chemical weapons…. This is a hotly contested issue and one that requires greater clarification. The rational approach would be for the UN to send a team of chemical weapons and forensic experts to the site of the bombing to try to figure out what really happened. Trump decided he couldn’t be bothered with such trivialities as a formal investigation. He was more interested in projecting the image of a strong and decisive leader which is why he decided to shoot first and ask questions later. His action was applauded by leaders around the world including Angela Merkel, François Hollande, Recep Erdogan of Turkey, Saudi Arabia, and Israel none of who believe that the United States should have to get the nod from the UN Security Council before bombing a sovereign country. Philip Giraldi– I am hearing from sources on the ground, in the Middle East, the people who are intimately familiar with the intelligence available are saying that the essential narrative we are all hearing about the Syrian government or the Russians using chemical weapons on innocent civilians is a sham. The intelligence confirms pretty much the account the Russians have been giving since last night which is that they hit a warehouse where al Qaida rebels were storing chemicals of their own and it basically caused an explosion that resulted in the casualties. Apparently the intelligence on this is very clear, and people both in the Agency and in the military who are aware of the intelligence are freaking out about this because essentially Trump completely misrepresented what he should already have known — but maybe didn’t–and they’re afraid this is moving towards a situation that could easily turn into an armed conflict. Scott Horton– Tell me everything you can about your sources or how you are learning about this? Philip Giraldi– Okay. These are essentially sources that are right on top of the issue right in the Middle East. They’re people who are stationed there with the military and the Intelligence agencies that are aware and have seen the intelligence And, as I say, they are coming back to contacts over here in the US essentially that they astonished at how this is being played by the administration and by the media and in some cases people are considering going public to stop it. They’re that concerned about it, that upset by what’s going on. Scott Horton– So current CIA officers are thinking about going public right now? 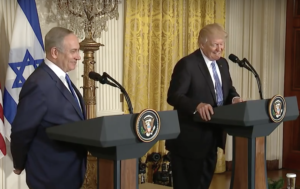 Philip Giraldi– They are, because they’re that concerned about the way this thing is moving. They are military and intelligence personnel who are stationed in the Middle East and are active duty and they are seeing the intelligence the US government has in its hands about what happened in Syria, and the intelligence indicates that it was not an attack by the Syrian government using chemical weapons… There was an attack but it was with conventional weapons–a bomb– and the bomb ignited the chemicals that were already in place that had been put in there by the terrorist group affiliated with al Qaida. Scott Horton– You say this thing is moving really fast. How fast is this thing moving? I think you’ll find that listening to the whole show is worth the time. Media analysts appear to be surprised that Russia hasn’t responded militarily to Thursday’s attack. Some even see it as a sign of weakness. But Moscow’s approach to Washington’s impulsiveness has been fairly consistent for the last decade or so. With as little fanfare as possible, Moscow goes about its business and works discreetly to protect its interests. Unlike Trump, Putin is not a man who likes to attract a lot of attention to himself. He likes to operate off the radar. Even so, Russia has a coherent policy in Syria (fighting terrorism and preserving the sovereign government) and it’s not going to veer from that policy. Most Americans don’t seem to understand that. Russia’s not going to budge, which is why the Kremlin cut off cooperation with Washington, shored up its missile defenses in Syria, and moved a frigate to the Mediterranean. Moscow does not want a broader conflict, but it will be prepared if one breaks out. Lie, bomb, kill, repeat. Konashenkov doesn’t sound surprised at all, does he? It’s a pattern, a deadly, frightening pattern. The only thing that changes is the names of the victims. “The concept of managed chaos appeared long ago as a method of strengthening US influence. Its basic premise is that managed chaos projects should be launched away from the United States in regions that are crucial for global economic and financial development. The Middle East has always been in the focus of politicians and foreign policy engineers in Washington. Practice has shown that this concept is dangerous and destructive, in particular for the countries where the experiment was launched, namely Iraq, Libya, Syria, Yemen and Afghanistan…In Iraq, Syria and Libya, this chaos was created intentionally. “Managed chaos”. Brilliant. That’s Washington’s foreign policy in a nutshell. That’s why there’s been no effort to create strong, stable, secular governments that can provide security for their people in any of the countries the US has destroyed in the last 16 years, because this long string of failed states that now stretches from North Africa, through the Middle East and into Central Asia (The ‘arc of instability’) create a permanent justification for US military intervention as well as strategic access to vital resources. So why waste money and time on nation building when nation building runs counter to Washington’s strategic objectives? Instead, decimate the nation state wherever you go, and leave the people to scratch out a miserable hardscrabble existence for themselves while fending off the relentless violence and persecution of tribal elders or local warlords. Is that a fair assessment of US foreign policy? Indeed, it is. And the Russian leadership understands the far-reaching implications of that policy. They know that Washington’s ambitions could result in a war between the two nuclear-armed adversaries. They fully understand that. Even so, they’re not going to budge. They’re not going to let Syria become another Iraq. They’re not going to let that happen. So, it’s all coming to a head. The unstoppable force is fast approaching the immovable object. There’s going to be a collision. Just two days after news broke of an alleged poison-gas attack in northern Syria, President Trump brushed aside advice from some U.S. intelligence analysts doubting the Syrian regime’s guilt and launched a lethal retaliatory missile strike against a Syrian airfield. operations while in the Mediterranean Sea, April 7, 2017. Trump immediately won plaudits from Official Washington, especially from neoconservatives who have been trying to wrestle control of his foreign policy away from his nationalist and personal advisers since the days after his surprise victory on Nov. 8. There is also an internal dispute over the intelligence. On Thursday night, Secretary of State Rex Tillerson said the U.S. intelligence community assessed with a “high degree of confidence” that the Syrian government had dropped a poison gas bomb on civilians in Idlib province. But a number of intelligence sources have made contradictory assessments, saying the preponderance of evidence suggests that Al Qaeda-affiliated rebels were at fault, either by orchestrating an intentional release of a chemical agent as a provocation or by possessing containers of poison gas that ruptured during a conventional bombing raid. One intelligence source told me that the most likely scenario was a staged event by the rebels intended to force Trump to reverse a policy, announced only days earlier, that the U.S. government would no longer seek “regime change” in Syria and would focus on attacking the common enemy, Islamic terror groups that represent the core of the rebel forces. The source said the Trump national security team split between the President’s close personal advisers, such as nationalist firebrand Steve Bannon and son-in-law Jared Kushner, on one side and old-line neocons who have regrouped under National Security Adviser H.R. McMaster, an Army general who was a protégé of neocon favorite Gen. David Petraeus. In this telling, the earlier ouster of retired Gen. Michael Flynn as national security adviser and this week’s removal of Bannon from the National Security Council were key steps in the reassertion of neocon influence inside the Trump presidency. The strange personalities and ideological extremism of Flynn and Bannon made their ousters easier, but they were obstacles that the neocons wanted removed. Though Bannon and Kushner are often presented as rivals, the source said, they shared the belief that Trump should tell the truth about Syria, revealing the Obama administration’s CIA analysis that a fatal sarin gas attack in 2013 was a “false-flag” operation intended to sucker President Obama into fully joining the Syrian war on the side of the rebels — and the intelligence analysts’ similar beliefs about Tuesday’s incident. Instead, Trump went along with the idea of embracing the initial rush to judgment blaming Assad for the Idlib poison-gas event. The source added that Trump saw Thursday night’s missile assault as a way to change the conversation in Washington, where his administration has been under fierce attack from Democrats claiming that his election resulted from a Russian covert operation. If changing the narrative was Trump’s goal, it achieved some initial success with several of Trump’s fiercest neocon critics, such as neocon Senators John McCain and Lindsey Graham, praising the missile strike, as did Israeli Prime Minister Benjamin Netanyahu. The neocons and Israel have long sought “regime change” in Damascus even if the ouster of Assad might lead to a victory by Islamic extremists associated with Al Qaeda and/or the Islamic State. Trump employing a “wag the dog” strategy, in which he highlights his leadership on an international crisis to divert attention from domestic political problems, is reminiscent of President Bill Clinton’s decision to attack Serbia in 1999 as impeachment clouds were building around his sexual relationship with intern Monica Lewinsky. Trump’s advisers, in briefing the press on Thursday night, went to great lengths to highlight Trump’s compassion toward the victims of the poison gas and his decisiveness in bombing Assad’s military in contrast to Obama’s willingness to allow the intelligence community to conduct a serious review of the evidence surrounding the 2013 sarin-gas case. Ultimately, Obama listened to his intelligence advisers who told him there was no “slam-dunk” evidence implicating Assad’s regime and he pulled back from a military strike at the last minute – while publicly maintaining the fiction that the U.S. government was certain of Assad’s guilt. In both cases – 2013 and 2017 – there were strong reasons to doubt Assad’s responsibility. In 2013, he had just invited United Nations inspectors into Syria to investigate cases of alleged rebel use of chemical weapons and thus it made no sense that he would launch a sarin attack in the Damascus suburbs, guaranteeing that the U.N. inspectors would be diverted to that case. Similarly, now, Assad’s military has gained a decisive advantage over the rebels and he had just scored a major diplomatic victory with the Trump administration’s announcement that the U.S. was no longer seeking “regime change” in Syria. The savvy Assad would know that a chemical weapon attack now would likely result in U.S. retaliation and jeopardize the gains that his military has achieved with Russian and Iranian help. The counter-argument to this logic – made by The New York Times and other neocon-oriented news outlets – essentially maintains that Assad is a crazed barbarian who was testing out his newfound position of strength by baiting President Trump. Of course, if that were the case, it would have made sense that Assad would have boasted of his act, rather than deny it. But logic and respect for facts no longer prevail inside Official Washington, nor inside the mainstream U.S. news media. Alarm within the U.S. intelligence community about Trump’s hasty decision to attack Syria reverberated from the Middle East back to Washington, where former CIA officer Philip Giraldi reported hearing from his intelligence contacts in the field that they were shocked at how the new poison-gas story was being distorted by Trump and the mainstream U.S. news media. Giraldi said his sources were more in line with an analysis postulating an accidental release of the poison gas after an Al Qaeda arms depot was hit by a Russian airstrike. Giraldi said the anger within the intelligence community over the distortion of intelligence to justify Trump’s military retaliation was so great that some covert officers were considering going public. “People in both the agency [the CIA] and in the military who are aware of the intelligence are freaking out about this because essentially Trump completely misrepresented what he already should have known – but maybe he didn’t – and they’re afraid that this is moving toward a situation that could easily turn into an armed conflict,” Giraldi said before Thursday night’s missile strike. The mainstream U.S. media has presented the current crisis with the same profound neocon bias that has infected the coverage of Syria and the larger Middle East for decades. For instance, The New York Times on Friday published a lead story by Michael R. Gordon and Michael D. Shear that treated the Syrian government’s responsibility for the poison-gas incident as flat-fact. The lengthy story did not even deign to include the denials from Syria and Russia that they were responsible for any intentional deployment of poison gas. the Mediterranean Sea, April 7, 2017. The article also fit with Trump’s desire that he be portrayed as a decisive and forceful leader. He is depicted as presiding over intense deliberations of war or peace and displaying a deep humanitarianism regarding the poison-gas victims, one of the rare moments when the Times, which has become a reliable neocon propaganda sheet, has written anything favorable about Trump at all. According to Syrian reports on Friday, the U.S. attack killed 13 people, including five soldiers at the airbase. 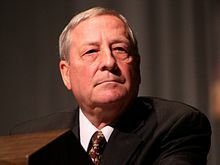 Gordon, whose service to the neocon cause is notorious, was the lead author with Judith Miller of the Times’ bogus “aluminum tube” story in 2002 which falsely claimed that Iraqi leader Saddam Hussein was reconstituting a nuclear-weapons program, an article that was then cited by President George W. Bush’s aides as a key argument for invading Iraq in 2003. Regarding this week’s events, Trump’s desperation to reverse his negative media coverage and the dubious evidence blaming Assad for the Idlib incident could fit with the “Wag the Dog” movie from 1997 in which an embattled president creates a phony foreign crisis in Albania. cat fleeing a bombardment in Albania. In the movie, the White House operation is a cynical psychological operation to convince the American people that innocent Albanian children, including an attractive girl carrying a cat, are in danger when, In reality, the girl was an actor posing before a green screen that allowed scenes of fiery ruins to be inserted as background. Today, because Trump and his administration are now committed to convincing Americans that Assad really was responsible for Tuesday’s poison-gas tragedy, the prospects for a full and open investigation are effectively ended. We may never know if there is truth to those allegations or whether we are being manipulated by another “wag the dog” psyop. On Tuesday 4 April there were reports of children and other civilians killed by chemical poisoning in the town of Khan Sheikhoun, Syria. There were contradictory reports, some saying they smelled the gas; others claiming it caused immediate death like odorless sarin. On Wednesday 5 April, President Trump blamed the Syrian government despite conflicting reports and contradictory information and accusations. 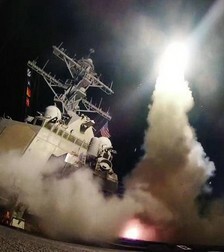 On Thursday, 6 April, Trump ordered a ‘targeted military strike’ on Syria with 50 tomahawk missiles attacking the primary Syrian air base near Homs. This base is used to support the combat with ISIS in eastern Syria and Nusra/Al Qaeda in Idlib province. As I will show below, it is likely the deaths in Khan Sheikhoun were caused by an armed opposition faction, not the Syrian government. 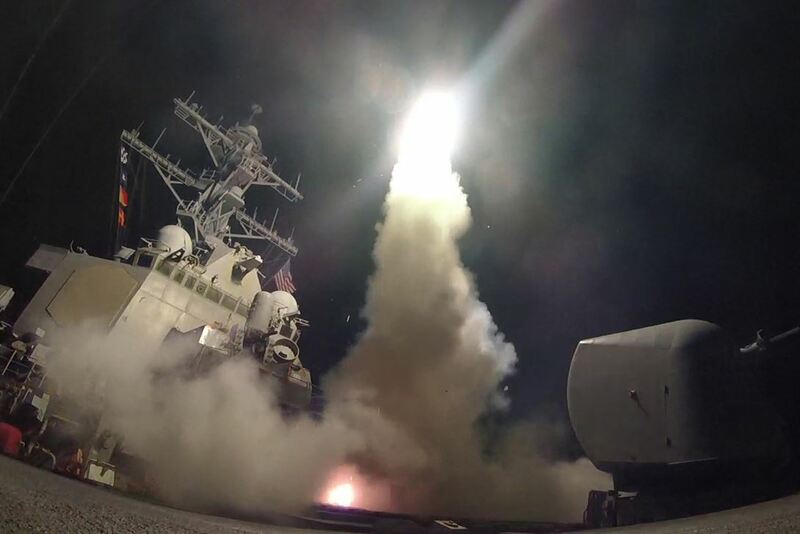 The goal was precisely what has happened: a media firestorm leading to direct U.S. aggression against Syria. – On 22 March, the government controlled town of Khattab was over-run by militants with some civilians kidnapped and taken to the nearby opposition controlled town of Khan Sheikhoun. – On 4 April, up to 80 persons, including many children, died at Khan Sheikhoun. Some showed signs of chemical poisoning. Photographs, videos, analyses and other sources are documented at “A Closer Look At Syria”. – one of the videos features a UK born and raised Dr. Shajul Islam. He received his UK medical license in 2012 but had the license suspended due to reports he was involved in the kidnapping in Syria of journalist John Cantlie. – Many of the video scenes depict an area set into a limestone quarry with apparent caves and storage depots. There are flat bed trucks with bodies scattered on the ground in this semi-industrial area. Other video show scenes in medical clinic. – Photographs show “White Helmet” individuals handling bodies without gloves which is very strange if they died or were dying from chemical poison. – The western government narrative is that the Syrian “regime” is responsible. They fired illegal chemical weapons into the town, primarily killing innocent civilians and many children. – The Syrian army acknowledges firing air strikes but deny using chemical weapons at this or any time. This area was the base for militant attacks against government areas in Hama province in the preceding weeks. The Russian Ministry of Defense says that militants had a weapons production factory including chemical weapon ingredients, and that may have been hit and caused the chemical weapon deaths. – A third theory is the kidnapped civilians from Khattab were killed or poisoned by the militants as part of a staged event. (1) The incident and publicity help the opposition and hurt the government. Crime investigations usually begin with the question: Who has a motive? In this case, it’s strikingly clear that the armed opposition and their supporters benefit from this event. They have used the story to further demonize the Assad government and make renewed calls for US and “the world” to intervene. The Syrian government is making steady advances in many parts of the country. They have no reason to use chemical weapons; they have every reason to NOT use chemical weapons. They know very well that the armed opposition has immediate access to major media. Accusations that the Syrian government intentionally attacks civilians is contradicted by their policies and actions. As demonstrated last December in Aleppo, civilians are welcomed from opposition areas into government controlled areas. Even Syrian militants are welcomed after they sign an agreement to lay down arms. It is also relevant to consider timing. There is a pattern of sensational events helpful to the armed opposition occurring simultaneous with critical international meetings or actions. In this case, the events in Khan Sheikhoun occurred the day before an important conference on Syria in Brussels. The conference titled “Supporting the future of Syria and the region” has been effectively sidetracked by news about the chemical weapons attack and the Syrian government being blamed. (2) Extremists were responsible for the August 2013 Chemical Weapon attack in Damascus. From the start, the Syrian conflict has included an information war. Hillary Clinton boasted of “training for more than a thousand activists, students and independent journalists.” In December 2012, NBC journalist Richard Engel was reportedly kidnapped and abused by “shabiha” supporters of the Syrian government. Engel and his film crew were “liberated” by Free Syrian Army rebels after a gunfight with the Assad supporting kidnappers. In reality, the entire episode from kidnapping to rescue was a hoax designed to demonize Assad supporters and glorify the “rebels”. The true story emerged years later after the actual events were leaked. When it was going to be made public, Engel finally admitted the truth. (4) Supporters of the armed opposition have a history of fabricating stories which demonize the Syrian Government. In February 2014, it was announced that a defecting Syrian military photographer, who was anonymous but code named “Caesar”, had 55 thousand photos showing the torture and murder of 11 thousand innocent Syrian civilians. This news received sensational media attention with live interviews on CNN and front page coverage throughout the western world. The news relied on the judgment of legal prosecutors who “verified” the story and produced a “Caesar Report”. 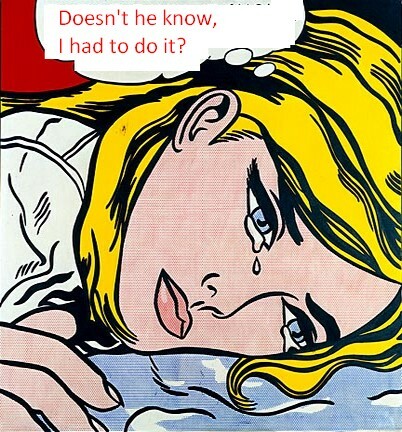 This was released the day before the start of Geneva negotiations. It effectively disrupted the talks and facilitated the “rebels” refusal to negotiate and walk away. In reality, the “verification” and report was commissioned by the government of Qatar which has been a major funder of the armed opposition. Since then it has been discovered that nearly half the 55 thousand photos show the opposite of what was claimed: they show dead Syrian soldiers and victims of explosions NOT tortured civilians. That is just one of the findings confirming the fraud involved in this sensational story. A concise expose of “Caesar” is here. – The PBS Newshour typically features two guests who are questioned by the host. The problem is that their guests consistently share the same basic viewpoint. On 4 April, one guest was from the Soros funded Physicians for Human Rights. She claimed, “We know that sarin has been used before by the Assad regime.” In fact that has NOT been confirmed by any credible organization. On the contrary, the most thorough investigations point to sarin being used by the armed opposition NOT the Syrian government. 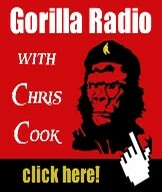 The other guest was Andrew Tabler from the neoconservative Israeli associated “Washington Institute”. His editorial from last Fall makes clear what he wants: “The case for (finally) bombing Assad.” The discussion on Syria at PBS Newshour is consistently biased. – The New York Times feature story on 4 April was “Worst Chemical Attack in Years in Syria; U.S. Blames Assad“. One of the authors, Michael Gordon, was an influential proponent for “weapons of mass destruction in Iraq” that justified the 2003 invasion. But that has apparently not hurt his career. In this story on Syria, he and co-author Anne Barnard claim that “American intelligence agencies concluded” the 2013 attack was carried out by the Syrian government. That is false. The intelligence agencies did NOT agree and the “assessment” came from the White House not the intelligence agencies. It is astounding that they either do not know this or they are intentionally misleading the public. Veteran Intelligence Professionals for Sanity explained the significance in their memorandum “A Call for Syria – Sarin Proof”. – DemocracyNow is a popular television/radio show. It is widely considered to be “progressive” but is also highly biased in its presentation on Syria. It almost solely promotes the perspective of those who support the armed opposition and/or western intervention in Syria. On April 5, they interviewed Dr. Rola Hallam. She is infamous for being the key player in the documentary “Saving Syria’s Children” which purports to show a chemical weapon attack in Aleppo but was actually staged. The “documentary” was then broadcast at a critical time trying to influence the 2013 vote in British parliament for an attack on Syria. On April 6, DemocracyNow interviewed another “Syrian” who lives in the West and promotes western intervention: Lina Sergie Attar. Viewers of DemocracyNow have no idea that the majority of Syrians support the government and especially the national Army in their struggle against invasion and terrorism. Public understanding about what’s happening in Syria has been seriously confused by the bad analysis of prominent analysts. Some have suggested that Israel was content to live with Assad. Former Israeli Ambassador to the US Michael Oren clarified the truth as he said “we always wanted Bashar Assad to go, we always preferred the bad guys who weren’t backed by Iran to those who were backed by Iran.” In short, Israel prefers Al Qaeda or ISIS or, better yet, the conflict to continue so that both sides are destroyed. Before the conflict began, in 2010, Secy of State Hillary Clinton made demands to Damascus that all revolved around Israeli interests. She wanted Syria to end its alliance with Hezbollah, to reduce its interactions with Iran and to come to an agreement with Israel. In contrast with what some analysts have said, Israeli interests have been a major factor driving and maintaining the conflict. With the liberation of Aleppo and prospect of a victory by Syria and allies, Israeli demands to escalate the war have probably increased. Evidently he believes all or most of the accusations which have been said about the ‘regime’. In sharp contrast with Chomsky’s assessment, it’s remarkable that Syria has held together as well as it has in the face of attack by some of the most powerful and rich countries on earth. Over 100 thousand Syrians have given their lives defending their country against the onslaught. Russia has supported their ally in compliance with international law, continually trying to work with the U.S. coalition as a “partner” against terrorism. Evidently Chomsky is unaware or does not believe the extent of lies that have been created around Syria. Evidently he does not recognize the distorted and shameful media coverage mentioned by Kinzer. Everyone makes mistakes but Chomsky’s poor analysis here is a whopper. If he was to visit Syria and talk with real Syrians I think his perception would be dramatically changed just as described by the PBS Frontline crew here. With consummate hypocrisy, both Syrian and Russian governments are now demonized by western neoconservatives and liberals who have done little or nothing to stop their own government’s collusion with terrorists raining havoc and destruction in Syria. International law has been undermined and replaced by “humanitarian law”. This has contributed to the current disastrous situation whereby the U.S. and NATO are waging aggression under a humanitarian pretext. International law regarding attacks on sovereign states is clear: it is illegal unless authorized by the UN Security Council or in legitimate self defense. It is clear that Syria poses no threat to any of its neighbors or any other nation. It is also clear that Syria has been the victim for six long years of aggression by foreign states which have funded and promoted a proxy army of fanatics and mercenaries from around the world. There has been a sustained attempt to derail Trump’s campaign pledge to stop the US “regime change” policy. This has been accompanied by a semi-hysterical demonization of Syria’s ally Russia. Liberals have been willing accomplices in this campaign which serves the interests of the U.S. military security complex, Israel and Saudi Arabia. 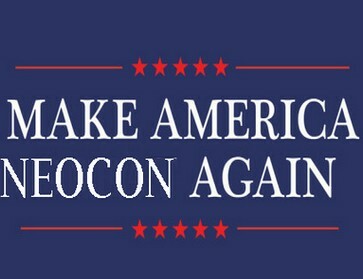 It looks like the foreign policy hawks and neocons have succeeded. Yesterday’s attacks on Syria mark an escalation in the war of aggression and violation of international law against Syria. This could lead to WW3 unless there is sufficient outcry and opposition. Rick Sterling is an investigative journalist. He lives in the SF Bay Area and can be contacted at rsterling1@gmail.com. Read other articles by Rick.